Take the turning to the south on the A40 signposted Talybont-on-Usk. It is about 5 miles from Brecon and 7 miles from Crickhowell. Drive to Talybont village. At the T junction, turn right past 2 pubs. Turn left up and over the canal swing bridge and follow the road around past the Tal-y-Bont Reservoir for approx 6 miles till it turns left over a bridge and steepens dramatically. Follow it to the top, where there’s a big car park on the right. Park here (P). There is a large purpose built car park (P). East take off is 2.29km walk minimum with 280m height gain and a stream crossing. West take off is 1.07km walk minimum with 240m height gain. Ensure you a physically fit and competent in a changeable outdoor environment to undertake such a walk. 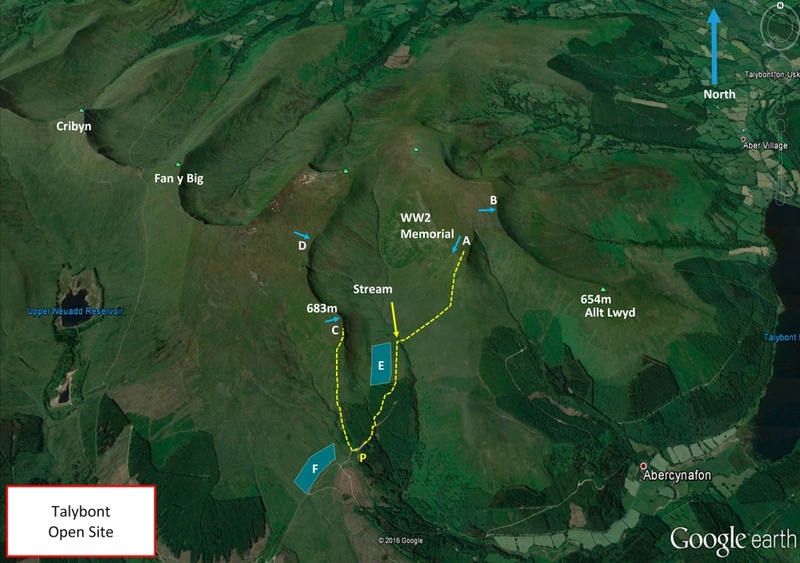 The Talybont site is actually the mountain Waun Rydd which is a flat plataeau to the east of Pen y Fan. SW – Cwar y Gigfran (‘Quarry of the crow’) & SE – Gwalciau’r Cwm top is clear and easily top-landable anywhere. Go out of the end of the car park, along the forestry track and take the path off to the left, (it is often muddy and may not look like the appropriate route) through to open country and a stile. Head along a footpath across the open ground and drop down a gully to the stream. Cross this and carry on across the open ground to the base of the hill. Head steeply up to the top of the hill – a hard climb. B (Craig y Fan) is at the top of a long spine back ridge. The east facing ridge can be flown in E but the Talybont site (Waun Rydd) is most commonly flown in a SW.
SW SE Can be used to hop across to A (which is a better ridge ) go back west out of the car park entrance and turn immediately right on a clear trail to the top of the hill. This walk-up shouldn’t take much more than half an hour. E – SE a very obvious large bowl with a well-worn path running around it. Top landing is possible, the entire top of the mountain is flat. Watch out for peat hags and for rotor behind steep slopes. Land at edge or 50m back. Bottom landing is at E or F. Be aware that the ground may be sloping away from you. One of the area’s best XC sites on light or nil wind days with a mainly Southerly component (SW to SE). Talybont is quite ‘alpine’ in character often with vigorous thermals and not much capacity to accommodate even moderate meteo winds. If there is a breeze in the car park when you arrive it’s very likely the hill will be blown out. In addition, Talybont can have significant anabatic flow for a UK site which can compete with the meteo wind. This can give the effect of a sudden change of wind direction with pilots inadvertently finding themselves in the lee and getting ‘flushed’. If you encounter significant sink do not attempt to side land. Fly out from the ridge to look for lift or land and walk back up. When flying near the hill, or for top landings, it is strongly recommended that a GPS be used to determine the true wind direction. This site is flown with the kind permission of- Royal Artillery. This site has a lot of potential for spectacular XC flights, flying over Pen y fan and the Brecon beacons. The ground drops away sharply to the East leaving lots of height to play with, but beware there is usually sink over Brecon. On light wind days it is possible to go in almost any direction so triangles and out and returns are a distinct possibility. NB On a potentially good XC day it’s a good idea to leave a car in the village and share a lift to the car park. It can be difficult to get back to the car park after an XC. PG – ‘The Brother’s Price’ (Lewis and James Price) flew an inseparable 119.3 km together on a memorable BCC day on 19 May 2018. The Brother’s Price flying across most of Wales in a southerly wind. TrawsCambria [free weekend travel] – www.trawscambria.info (a 2 hour service from Newtown/Llandrindod Wells (704) connecting with X43 in Brecon which goes to Abergavenny or Merthyr Tydfil and Cardiff, or take the 714 to get to Llandovery. Due to the size of this site and the potential dangers of operating in a mountainous environment with the inherent changeable conditions associated with such environments. Individuals are advised to be competent at calling in the emergency services and giving co-ordinates themselves.